The children of former billionaire Sean Quinn are “attempting to rewrite history” by claiming they are not liable for hundreds of millions of euro in loans advanced by Anglo Irish Bank, the High Court has heard. Counsel for Anglo’s successor, the Irish Bank Resolution Corporation (IBRC), said it was clear the children had signed and authorised loan guarantees and share pledges related to borrowings from the bank. Paul Gallagher SC said the family’s business empire was once valued at €3bn, but now it was worthless “they seek to rewrite history”. Mr Gallagher made the comments as he continued his opening of IBRC’s defence of an action by the five Quinn children. 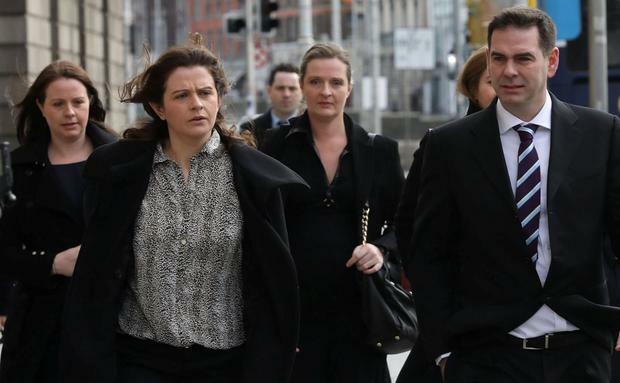 Sean Jr, Ciara, Colette, Brenda and Aoife Quinn say they should not be held liable in connection with €2.34bn in loans advanced by Anglo in 2007 and 2008 to fund losses by their father’s disastrous speculation on stock market shares. The court has heard the children were the shareholders in Quinn Group, whose companies drew down the loans from Anglo. They claim they were unduly influenced by their father, who they say controlled the business even though they were the shareholders. They also alleged Anglo behaved in a “morally reprehensible” manner towards them when they signed loan guarantees, and that they were never advised by the bank to take independent legal advice. Mr Gallagher spent much of the morning going through various transactions involving the children, which he said clearly demonstrated their deep involvement in the running of the family businesses. He told Mr Justice Garrett Simons that IBRC had identified “a multitude of documents” relating to borrowings, guarantees, shareholdings, pledges, charges and powers of attorney. Mr Gallagher said none of these were being challenged in the proceedings and no issue had been raised about them, yet the Quinns sought to challenge similar documents relating to the Anglo loans. “These were people used to dealing in enormously large transactions and giving people power of attorney,” said Mr Gallagher. The barrister also queries claims the children had modest lifestyles, with salaries of €21,000 and €31,000. He said that far from having no assets, the children owned the home where their father and mother lived and had been able to give gifts worth €12m to their parents. He also cited the payment of €4.8m to the children by one of their companies, Quinn Investments Sweden. “These were enormously rich children,” said Mr Gallagher. The barrister said the court would hear during the case of attempts to move assets beyond the reach of IBRC’s liquidator. “The detail, the deviousess, the absolute malintent of the fraud will only become apparent when we cross examine the witnesses,” he said.